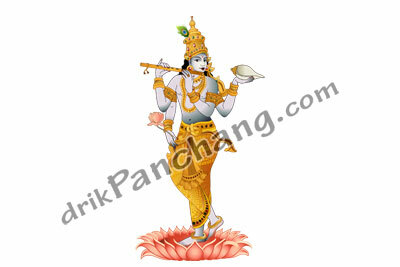 Lord Krishna is one of the most popular Gods in Hinduism. He is believed to be the ninth incarnation of Lord Vishnu (in some regions Lord Krishna is considered as the eighth incarnation of Lord Vishnu). Lord Krishna was born during Dvapara Yuga out of four cyclic Yugas described in Hindu scriptures. Based on scripture details and astrological calculations the date of Krishna's birth is 18th July 3228 BCE and date of Krishna's death, when Lord Krishna returned to His eternal abode ofVaikuntha, is 18th February 3102 BCE. The present Yuga which is known as Kali Yugastarted after the death of Lord Krishna.